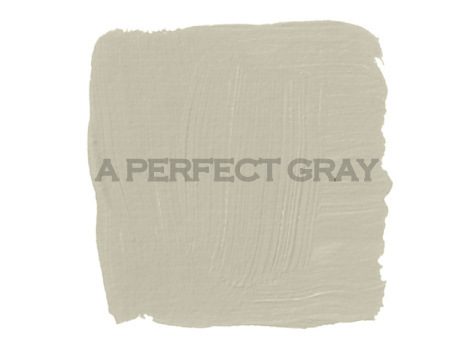 a perfect gray: what makes this work? Bookshelves are hard for me. I have tons of books but getting the look I want on my shelves isn't easy. I like this look. What makes it work? The mix of items? The monotone colors? The arrangement...? I like bookshelves when the books are stacked in different ways, some on their sides, some on their bottoms, some facing forward etc. So, just like this little number! Happy Monday, Donna. Donna -- beautiful choice of bookshelves to showcase here. I think what works is contrast: 1) a bright color contrasted by the mellow pewters and whites; 2) and a the contrast of shapes (repetitive squares contrasted with individual pieces in each square). yes, yes & yes! I think the repetition of the same height in each square (and really the same volume in each) and the same colors. It's not easy to accomplish that, you're right. I think that what makes it work is the color scheme because is basically two or three in different shades that makes it harmonious. The minty blue in the back ground makes everything pop that's probably why there is not many books to let the color be seen and of course what does not look great with brass as an accessory? I actually wrote something about it on my post today. It's hard one, isn't it. I always no if it *doesn't* work but can't quite put my finger on WHY when it does work! yes. yes and yes. For me its just a matter of playing with things for awhile until they look just so...I have a hard time believing that your own book cases are anything less than stylin' though! HI, you don't know me, I don't think I have ever commented to you before. But I share your love of everything decorating. 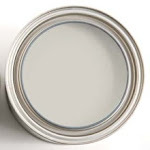 I love your website and the focus on the color gray. So on your question about these bookshelves, I think the answer is yes, to all three. I think it is the repeat of materials. The first thing I see is the size of the shelves, they are square and all seem to be the same size. Next the color pattern all things in white, bottles in green, and metal items in tarnished silver. So there is a repeat in shape, color, and objects, yet still interesting. I would say that the monochramatic color scheme unites the spaces. Balance plays a huge role. The weight of each space is concentrated in the center so they are not competing with each other but read like a gallery wall arranged in a grid pattern. I love arranging bookcases! I struggle with bookshelves too. I don't like the pressure of having to arrange it all and removing it all for cleaning. I think this works because of the mix of materials and tones. everything just "works" I love it! I think it is mostly the colors that make this work... I have a hard time with books shelves too! I think it's sort of the color scheme and the sparseness of it. They also did a great job creating levels too. I love this shelf I've seen it before but I don't remember where. The light teal is a beautiful color! i would say all three make it work! I think it's the mix of light and dark but like you I have way to many books to be doing this, I need the shelf space! 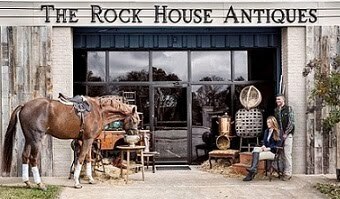 The lack of business and confusion even though there are quite a few objects, which are really beautiful by the way...old silver, old glass and creamy whites, against a robins egg blue...one of the prettiest combos ever! I'm actually working on a post right now that's about filling my bookshelves...I think you just have fun with it and play, play, play...with all of your most favorite treasures of course. There's definitely a nice symmetry to them - and they aren't over crowded. I think it takes a lot of trial and error until you get them how you want them. These are display shelves, not BOOK shelves, which are a whole other problem! These ones work well because of the symmetry and the close colour harmonies that have been used. I have no problems with my own display shelves, but my book shelves look a mess! Bookshelves are hard, and it isn't easy making them look effortless and not contrived. I think you have something there with all of your points. I would add that looking at the shelves and how they relate on the diagonal is important to. If they relate well on the zigzag. Creating a balanced and interesting look with bookcases is a challenge; it takes time and practice to achieve a look that is pleasing and not over done. What I think makes the above unit work is they've treated each square as a vignette with similiar elements. 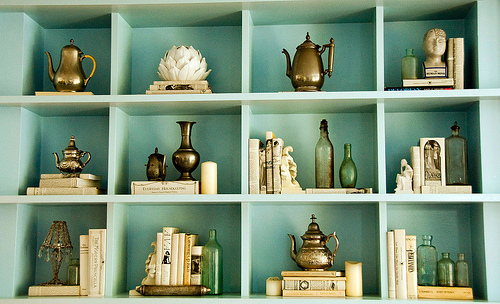 Each vignette contains cream colored books and green glass or a brass object. Each vignette takes up about the same amount of space in each square (notice how the largest object stands by itself, it is large enough to make it's own statement). The background color and the colors of the objects all have the same tonal value so nothing jumps out, allowing your eye to take in the arrangement as a whole. It works for me because of 1. the contrast between the 'light' of the books and the 'dark' of the metals (I love high contrast) 2. the intricate vignettes are balanced with the simple cubes (I like clean and simple - too much overwhelms me but the simple cubes make it work) & 3. the lack of color in the objects juxtaposed with the paint 4. everything is balanced within each cube and as a whole. This is a great example of bookshelves. I think it works b/c of the size, color and proportions of the items. They fill the space in some places and then leave some openness in others. Really well done! This is 'styled' and the books really are just for display! It's hard to make shelves look good when there are actually books that have been read on them! This is a great look no doubt, but it is 'magazine' not 'homey'! I agree with Will, and I think the unusual color certainly helps. It's like a Tiffany box full of goodies! I agree with anonymous, it doesn't quite work for me. Too many small objects and vignettes reminds me of grandma's house. The styling (every cubby is a piece of art) and the color scheme. All pretty earthy neutral against the colorful backsplash. (All the books are in one tone!). Hope you had a fun and spooky weekend! as tim gunn would say...edit, edit, edit. i think they did lots of editing on this one and a nice choice of theme. i am totally with you...no exposed books in this house, but i am on the verge. ahh, mee too! I have the most awefull book cases right now, makes me cringe. I can't seem to get it right. All the above! I do think that cubies are easier. I think Share my garden hit it--and messy book shelves are beautiful! Loved and inviting as tousled hair. I have an article filed somewhere about styling shelves that says there should be one common object that is placed in a "Z" shape. Sort of looks like the brass teapots are doing that, don't you think? A little something of everything but I think it is the 3 colors and mix of finishes. Bookcases are hard for me too! I love those lamps and bottles. I love the neutral tones - like a pacific ocean beach with that wonderful contrast through the metal objects. Love the detail in the sculptures. Overall I think it is the monochromatic tones mixed with broken-up angles through the books, the opaque vs transparent that work the best. Essentially three colours expressed through an array of shapes and objects. and don't forget great lighting & professional photography...they make such a difference. I'd never be able to pull that color off, but it's gorgoeus!!! gorgeous! I'm usually attracted to white shelves, but these take my breath away. I love the simplicity- I think I often overcrowd my shelves and try to do too much. I like the simple color scheme too. Though realistically, not all of my books are white or cream! the mixture of things and styling is perfect! Divine - a great lesson in courageous color and repetition. Love the painted bookshelves with the beautiful mix of white/pewter/turq objects. 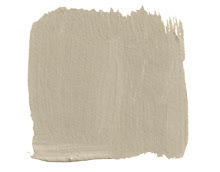 my aunt lived on the Detroit River and her interior was this color because it matched the color of the water outside.. it was as though she thought it was 'gray:'neutral. It was lovely and she kept other colors in the house minimal but lively.